Qwkswede's 1992 244 daily driver. Back to my rolling roots. Definitely needs a touch more drop up front, still looks a little 'stock' and skyward bound. Looks good otherwise! pain, suffering, and time. and an ejected remote oil filter adapter (that the current owner installed). had to remove the mount to perform the repair, this took cheater bars, profanity, an early AM beer, and far more time than should be required. on a somewhat related side note, if one is installing a remote filter, one should build some slack into the system apparently or one risks fatiguing and forcibly removing said filter adapter. This results in a variety of attention from non-combatants. Well I'll buy you a beer next time I see you to pay for that. I do miss that car at times. It was a good one. I didn't know that you worked on that car with Andres, thats cool to hear. Did you guys do some MS tuning? I always kept that tune and boost levels pretty conservative on that guy just for reliability. Not sure where he went with that after the sale. yeah, a little bit of tuning and a lot of emergency repair yesterday. mostly econ tuning, and leaning it out of the 10's in boost. MS reads 5-6psi lower than the two boost gauges, found that a little odd, but told him not to mess with it until he's got time to re-tune things. 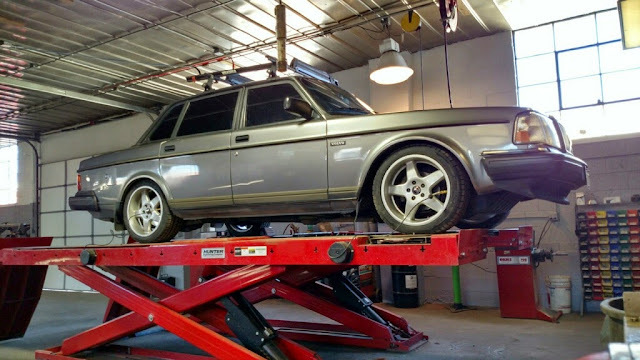 I took the Volvo in for some work at the local independent shop Volvo Specialists. This place is run by sincere enthusiasts. These guys have more lowered Volvos than any place I have seen outside the Stancework website. We lowered the front about an inch more, and dialed the camber to -0.5 on both sides. Its not slammed and still has plenty of downward travel. Denvers roads rival many 3rd world countries for rough pot holed nastiness, especially after the rough winter we had. It still has enough compliance to drive almost normal speeds without fear of breaking something. I also had them set the valve lash aiming for the looser side of the range. I was hoping there was some lost power hidden there, because some of the clearances were really tight with the new cam. But it is still the same old slowpoke. We also cranked the wastegate rod inward about 4 turns, and nothing changed. My mechanic friend verified my concern that thi is infact the slowest turbocharged Volvo he has ever driven. We scratched out heads a while trying to come up with some solutions. Its very mysterious still. I'm going to pull the downpipe loose next to get a look at the wastegete assembly. Maybe sticky rings? Have you tried filling the bores with seafoam and leaving it to soak overnight? That alone picked up 3" of hg at idle for me and a whole lot of responsiveness. Speaking of which...how is your idle vacuum looking in N, stopped in D? My mechanic friend verified my concern that thi is infact the slowest turbocharged Volvo he has ever driven. Also, sweet looking car man. Best of luck with the diagnostics. I don't have an idle valve right now, so the car revs to 1500 in neutral, and is held to 950 by the trans/torque converter in drive. From datalogs, I am seeing 55kPa in drive and about 40kPa in Neutral. The seafoam idea is interesting. I hadn't thought about trying that. Last edited by qwkswede; 03-17-2015 at 12:25 AM..
Based on KDEN's barometric data that translates to 8.59 inches of Hg at 950 RPM, which is very, very low. I would say those rings are definitely sticky and/or worn, and that the decent compression numbers may be a result of carbon deposits on the piston/CC area. Interesting thought. What vaccuum does a healthy motor pull? I never have a gauge connected to watch it. And to qualify those numbers a bit, I'm basically doing a brake stance because the idle hangs so high in neutral. The engine is pushing pretty hard when stopped with the brakes on. But your logic makes sense. If it does have extensive carbon buildup, then maybe some Seafoam might help. I still find it odd because it doesn't use any oil really. My B21 sees 15-17" Hg with no load and 11-12" at 900 in D, stopped. I feel you on the brake pedal idle control. Makes it too easy to lock up the fronts when my idle is high and wonky. Same here, b230 N/A stock 20hg / 16hg. are you blowing a lot of stuff out the breather? popping the dipstick out of the tube? seals leaking? Nope, the motor seems tight by all normal measures. Very little blow by that I can see. I'd agree on the stuck rings. You will usually have other issues as well. As for vacuum, my wagon is in the 55-60kpa range in gear, 40kpa in N. The 140 on the other hand has ALWAYS been low, sitting around 55-60kpa at idle. Bump it to 1000-1100 and it's around 35-40. Never been able to figure that one out, nor has anybody else. Any chance the cam is going flat? Leakdown test show anything? Ignition side good under load? Fuel pressure good at WOT? The cam is OK. I just had the valves adjusted yesterday and it looks good in there.. Its brand new, about 1000 miles on it now. The fuel pump is brand new, the old one died a month ago. The regulator appears to be working correctly judging by the AFRs that hold rock steady and the injector pulsewidths are right where you would expect for a motor making about 101 hp. I have not done a leakdown test yet. I do have a gauge though. I really think something mechanical is amiss with the longblock. Even before turbocharging this was the slowest Volvo I ever drove. I blamed it on LH problems, but I think this problem was there before the turbo went on. what happens when you slap it with more timing? does it knock? can you slap it with more timing? Has the head been off? if not, wonder if there's any between-cylinder issues causing problems. Can't think of anything else that wouldn't manifest itself in an obvious way.. a BHG would be pressurizing the cooling system or crankcase. Broken crank sprocket that slipped would have shown up with the TDC test. same with broken cam roll pin. Flexplate installed incorrectly would have been comically obvious with LH and likely still obvious with MS. I'm just not sure what else could be wrong with the engine itself that wouldn't be obvious. I'd think if you had really bent rods, it would have shown up on the compression test (and probably in other ways as well). How's the transmission holding up? any chance it's dragging badly? I'd think it would spool quickly with that kind of load though. Vacuum is a little low but not bad given the altitude. I dunno, something really is odd. Is it normal off-boost, or still slow there? I would wonder still about a cat issue when you get around to pulling the downpipe. Any chance the coil is breaking down under load? Fought that for a few weeks on mine until I checked it hot vs. cold and saw a huge resistance difference on the secondary side. Jumped about 3k when it warmed up, where a new coil resolved it. - I did perform the compression test with all plugs removed. - The transmission is holding up OK for now. Its not taking the beating I would hope for with the current performance levels. So no complaints from it yet. - Timing experiments. I did have the spark timing too aggressive at higher boost for a while, and it would knock a bit if I got into the mid 20s BTDC at 10-12 psi boost. It seems like I'm about 18-20BTDC now, it can be seen on the datalog I attached before in the thread. I mostly noticed knock when I was pulling the long steep grade in the mountains last week. You drive with heavy/full boost for 10 minutes straight in some stretches there. - I keep ignoring Gary's ignition comments, not on purpose. I haven't played much there. I figure its working and not misfiring. I do have a spare coil I could try, but haven't really been thinking about that at all. My brand new Magnaflow catalytic converter has now developed a rattle. So if the cat was not a problem, it soon could become one. I might have to give it the broom handle modification if it continues to rattle. Damn, Are you trying to tell me that a 16v cylinder head will solve my vaccuum issues? I do need to drive this to work tomorrow.